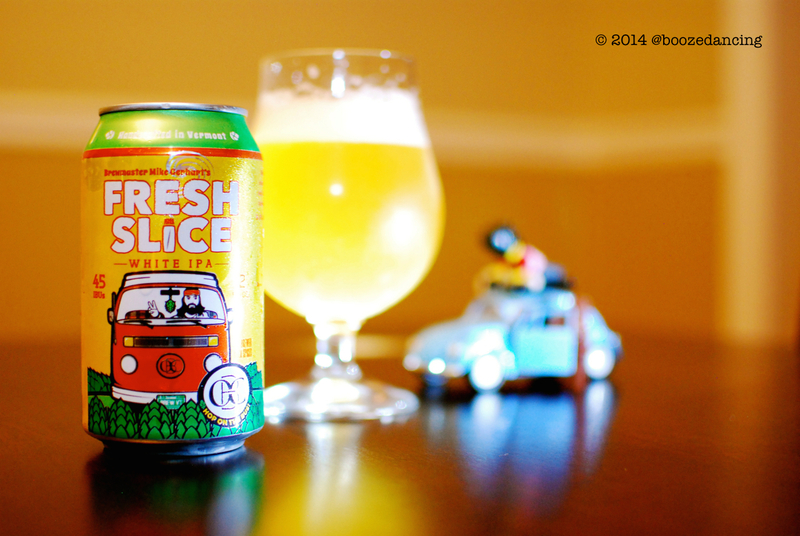 I wish there was an interesting story about how I acquired this can of Otter Creek’s Fresh Slice White IPA, but sadly there isn’t one. During a recent lunch time Craft Beer run to The Foodery, I noticed this bright and cheery little can in their beer fridge and decided to pick one up for an eventual review. I get to pick up mixed six pack of beer during my lunch hour. That’s certainly much better than having to do stuff like paying your mortgage or argue with the Philadelphia Parking Authority during your lunch hour. When you put it all into perspective, a lunch time Craft Beer run may not make for much of a story, but there are a hell of a lot worse things that I could be doing. Appearance: Cloudy, pale orange color with a good bit of sediment floating throughout. Thick off white foam that tops out at about 1.5 inches and dissipates really slowly. Aroma: Hints of coriander and clove along with a blast of citrus. The brewer says they added clementines and I am inclined to believe them. Push past all that stuff, and you definitely get a healthy dose of citrusy hop notes. Taste: Moderately carbonated with a creamy mouthfeel. Starts off like a Belgian Wit, i.e. with some prominent clove and coriander flavors. At the middle, the tart citrus and hops take over, but never overwhelm. Gets quite astringent at the finish with a pithy tartness thats leave your mouth kinda dry. I’m intrigued by the White IPA. It’s an interesting mash up of beer styles, i.e. the thirst quenching qualities of a Belgian Wit mixed with the hoppy bitterness of an IPA. While I enjoy the occasional Belgian Wit, they can get boring after awhile, so adding a dose of hoppiness into the mix definitely adds a bit of intrigue. As far as the Fresh Slice goes, while I definitely liked it overall, I’m a little disappointed by the finish. It’s a wee bit overly pithy, i.e. the aftertaste is what I imagine my mouth would feel like after chewing on an orange or lemon rind. Peatin’ Meetin’: The Southern California Summer Whisky Party!